Home is your child’s first and most important classroom and you, Mom and Dad, are your child’s first and most important teacher. Children learn throughout every moment of the day, not just at school. While home should be a place of comfort and rest (not flash cards and other drills), it can still be stimulating and engaging, which will promote peace and rest for everyone in the family. In the early 20th century, Maria Montessori surprised parents, educators and professionals by teaching adults that children do not see life, nor do they experience life, as an adult does. They require different sized furniture and apparatus to succeed in caring for themselves. She also taught that children absorb knowledge from their environments and so adults should make an effort to create engaging, attractive and organized environments for children. A cost-effective and simple application of this teaching is to create learning-centers at home. Next time you drop your child at preschool, stop and take a look around their classroom. You’ll notice several neatly organized learning centers with child-sized objects displayed for learning at your child’s height. Preschool teachers select these items for the classroom because they stimulate a child’s desire to learn, engage their attention, and enhance their learning experience. Why not try this at home? If you are interested in more reasons to stray from the cultural norms of arranging play-things at home (i.e the playroom) check out my article on “Rethinking the Playroom”. If I have already convinced you, read on! The good news is you likely already own most of what you’ll need to create activity centers at home, it is just a matter of rearranging. The bad news is, if you are accustomed to a playroom, that you’ll need to adjust to sharing some adult space with your kids. I promise that everyone will be happier, learn more and come to enjoy the new arrangement. Just give it a try! Play centers are typically themed. For instance, an art center, science center, manipulative table, space for puzzles, reading nook, dress-up center, blocks/building area, train/activity table, kitchen/pretend play area, music corner, etc… Look at the supplies you already have to decide which centers you want to create. If your kids love music, then make a music center. If they love building, then make a block center, etc…. Make sure to offer a variety of opportunities. Young boys love playing kitchen, just like young girls love science and building. Try to decide on 5 learning center themes for getting started. Next, you’ll need to find space to create each center. Where in your home do you and your children spend the most time? 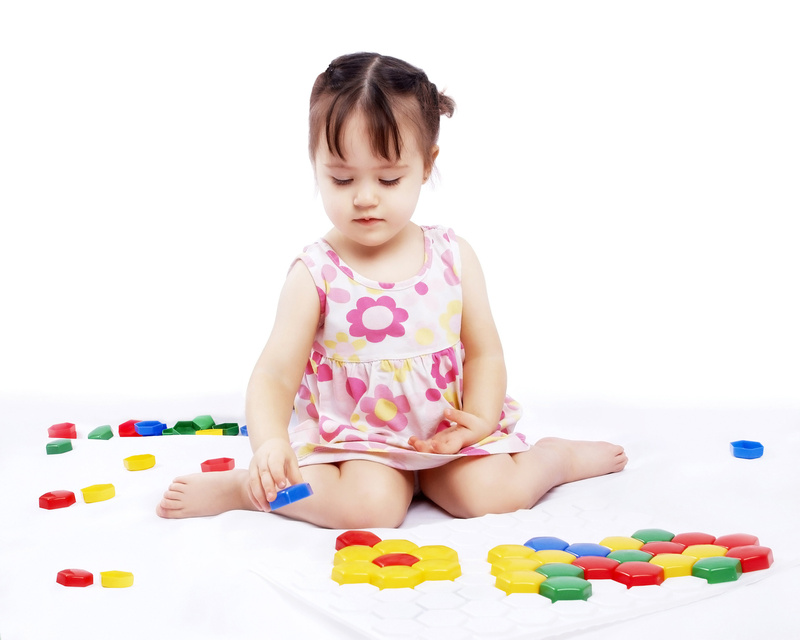 Most young children like to play and learn near their parents. If you spend most of your day in the kitchen, then find space in or near the kitchen for centers. If you are in the basement most of the day, then design centers near the basement. Thankfully, young children are small and do not need a lot of room for an activity center. Simply offering a drawer with bowls, measuring cups and utensils in the kitchen can count as a kitchen center. Children will, of course, want to dump the contents of the drawer, but keeping the center small is great because then your child can reasonably be asked to clean it up when they are done playing. Art centers are easily created with an easel. They offer a simple stationary piece of furniture that can be used with various types of art supplies. I keep the extra art supplies in a cabinet out of reach and list the options available when a child approaches the easel. Some days paint is offered and others it isn’t because it requires more clean-up. Crayons and chalk are always available and the children can ask to use markers, stamper paints, watercolors, grease markers, colored pencils, stamps and ink, child-safe scissors, tape, etc…. Notice the art center only takes up one corner of a room. A easy way to create a center with many different purposes is to use your child-sized table. Each day (or week) the activity can change from science to puzzles to art to math, etc… The key to turning the child-sized table and chairs into a center from simply a piece of furniture is to always have an activity on the table and call the table an “activity center”. These actions will help your child build expectancy. They will learn that when they choose to play at the table, an interesting activity will be offered. Display the activities with many parts in a bin to help keep the pieces together. Keep the activities simple so you don’t burn out. Here is our activity table this week. I am offering paper clips and horse-shoe magnets to play (science). It took me only 2 minutes to display this activity. To create a reading nook, find a corner of a room and place soft pillows, blankets, a rug or a child sized chair in the corner. Display books next to the comfy accessories. You can use a wall mount (as seen below) to display books, a little book display case (as seen here) or just prop the books up on the floor, slightly opened like they do at the library. Try to avoid book cases that require you to place the book in a slot that only shows the binding to the child. Remember young children are not yet readers. The beautiful colors and pictures on the cover of children’s books are their to invite children to open and read the book. They need to see the pictures in order to take initiative on their own. Once you have established your 5 new activity centers in your most trafficked rooms, spread out around the house. Strive to create one center in each room of the home that is safe for children. Keep in mind that centers can be simple- a small basket or drawer filled with themed items for play will do. Use small rugs or corners of rooms to section off an activity center. Montessori taught us that kids learn the most from and enjoy activities that mimic adult work. Children have a natural desire to copy your behaviors because they need to learn how to survive in the adult world. Therefore, offer real kitchen items for play in the kitchen. Offer safe tools if you play in the garage. Find objects for play in the laundry room that will allow the child to mimic cleaning the clothes. Have fun and be creative and do share ideas, questions and success stories! I love these ideas! I am looking for a child-size chair to create a reading nook. Any ideas for one that kids can grow with? My son is almost 4 and the ones that I have researched are marketed for ages 1-3. Thank you! Interesting post. I was wondering if you combine the idea of play centres with having toys placed round a rug as pictured in your post on toy rotation. Would the play centres replace the need for this? I’m struggling to find the space for a rugged area just for the kids so the play centres would work better. Absolutely, using multiple (yet smaller) areas to display toys can replace the need to use a larger rug with toys. I use the rug in the picture as a primary play center. It is the center I focus on providing a wide variety of toys and rotate toys in and out of each week. There are other, smaller areas (not withstanding the gross-motor “rough” playroom) throughout my home that serve as play centers with toys that rotate. For example, a play kitchen, tot table with puzzles, an art easel, an odds and ins basket filled with random boxes, bags, ribbons, etc… located in a bathroom, a kitchen island that has small manipulative like magnets and paper clips, etc… You definitely do not need to have a large primary play area. Many, smaller play centers, located throughout the home, is much more effective than one larger playspace (like a playroom). However, if you have space then it is a nice bonus, but not essential.